It is 10 years since this, the first Simon Serrailler novel by Susan Hill, was published. I recently read the eighth in the series and it made me want to revisit the beginnings of the character of Detective Inspector Serailler and the cathedral city of Lafferton. I remembered two things, the enigmatic DI, and the misty spooky Hill, its ley lines and standing stones. Re-reading The Various Haunts of Men, the dichotomy of the setting was as I remembered it: cathedral, choir, close-knit community, beautiful countryside and looking over the city, The Hill. Benign and beautiful by day, spooky by night. One woman disappears, a private, quiet, hard-working woman. Next, a dog vanishes on The Hill. Alarm bells start to ring with the third disappearance, a young woman, plump, problem skin, depressed, who has recently developed an interest in alternative therapies. Characters are introduced and there is that extra frisson at the beginning of a series when every character is unknown: which are the victims, which is the murderer? With the luxury of ten years since my first reading, I did not remember the identity of victims or criminal. Re-reading it, I wasn’t disappointed. It has spurred me on to re-read the next. This is the first Simon Serrailler novel, published in 2004. 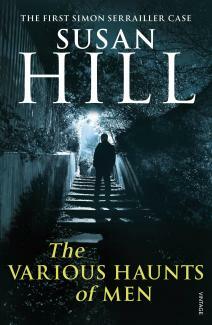 For Susan Hill’s other books, click here for her website.